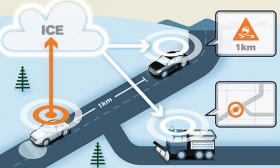 Volvo Cars is joining Swedish transportation officials in a pilot project in which road friction information from individual cars is shared within a cloud-based system. 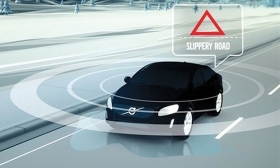 When the test car detects an icy or slippery road patch, the information is relayed via Volvo Cars' database to other vehicles approaching the slippery area. The information is also sent to the transportation officials, enabling the officials and contractors to quickly remedy the problem. Volvo Cars' Drive Me pilot program announced last week will push autonomous driving a step closer to reality by putting 100 self-driving XC90 crossovers on Swedish streets by 2017. The vehicles will be driven by ordinary people in Volvo's home city of Gothenburg using a controlled 31-mile route. They'll be used for daily commuting on roads with a barrier between the lanes and operate "in real traffic in a real situation," the company said. The trial will run until the spring of 2019. "We are entering uncharted territory in the field of autonomous driving," said Peter Mertens, senior vice president of r&d at Volvo Car Group. "Taking the exciting step to a public pilot, with the ambition to enable ordinary people to sit behind the wheel in normal traffic on public roads, has never been done before." Volvo is collaborating with Swedish authorities. The cars will be leased to drivers, but they won't be charged for the full cost of the technology. Volvo experts discussed the project during an Internet press conference. Vehicles communicating with each other and with road signs, traffic lights and other infrastructure enables vital information to be shared -- creating a more comfortable and safer drive. The technology is based on communication between transmitters in vehicles and the road infrastructure, and makes it possible to transmit information about local icy or slippery road patches from one car to other vehicles. The autonomous vehicles will use a network of sensors, cloud-based positioning systems and intelligent braking and steering technologies. They'll use a new Volvo autopilot system that allows the vehicle to take over steering, turning, braking and parking. The trial will run on specific public roadways "without oncoming traffic, cyclists and pedestrians," Volvo said. "It is relatively easy to build and demonstrate a self-driving concept vehicle, but if you want to create an impact in the real world, you have to design and produce a complete system that will be safe, robust and affordable for ordinary customers," said Erik Coelingh, a Volvo technical specialist. The driver will be able to take control in critical situations, Volvo said. Volvo said it has built in fail-safe systems, similar to those in the aircraft industry, so that the autopilot system continues to work if an element is disabled. For instance, the vehicles will have a second, independent brake system. The system also will prompt the driver to take over during "exceptional weather conditions, technical malfunction or the end of the route," Volvo said. "If the driver is incapacitated for any reason and does not take over in time, the car will bring itself to a safe place to stop." Volvo executives didn't say what countries they'll target for sale of autonomous vehicles but indicated "the U.S. is an interesting market for autonomous drive." "The customer demand is high -- commuters in megacities -- road conditions are appropriate, and the authorities are positive," said Karl-Johan Runnberg, director of government affairs for Volvo Cars. Runnberg said the cost of an autonomous-driving system won't be much higher than that of today's active-safety and driver-support systems. Volvo will disclose which suppliers it is working with closer to launch, he said. The 2016 XC90 that goes on sale in May already has some of the systems -- including three radar systems and four cameras. The sensor technology and algorithms will be reused for the self-driving cars. Volvo experts said the technology for the pilot project is "producible in the near future." "By putting it into the real world, we will find limitations, we will learn and we will adapt," said Coelingh. "Within this limited scope, we can verify if it is safe." The vehicles will have data recorders similar to an airplane's black box so Volvo can determine the cause if a crash occurs.